The keen eye of an Elk Grove Police officer led to the arrest of two suspects early Tuesday morning and the discovery of stolen assault rifle. According to police reports, around 3 a.m. an EGPD officer observed 34-year old Troy Lamont Haulcy of Hayward flee from a parked vehicle then jumped a fence near Ranfurly Drive and Trenholm Drive. Officers contacted 29-year old Steven Donnell Fobbs Jr. of Oakland, who was in the car, and observed an assault rifle in plain site. A records search found Fobbs was on probation and that the rifle had been reported stolen by Daly City Police. A probation search of the vehicle led to the discovery of marijuana and narcotics. A search aided by the use of a K-9 unit led to the discovery of Haulcy in nearby residential backyard. The suspect initially resisted arrest but was apprehended by the K-9. Both suspects were booked into the county jail and remain in custody on bails of $600,000. But, but, but they were just turning their lives around. One was headed to Stanford and the other is an aspiring rapper who had just enrolled for the winter semester at Berkeley. Actually they are ghetto rats from the Bay Area. Sad that the K-9 didn't bite off the Suspect Number 2's family jewels. That would have stopped him from breeding. Location: Ranfurly Dr. / Trenholm Dr.
An EGPD officer observed S-2 (Hayward resident) flee from a parked vehicle then jump over a fence into a residential area. S- 1 (Oakland resident) was observed sitting in the driver's seat of the vehicle that S-2 had fled from. Upon contact, S-1 was found to be on probation. 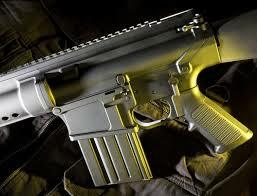 S-1 was detained and a loaded assault rifle, that had been reported stolen by Daly City PD, was located in plain view on the rear passenger floor. A probation search of the vehicle led to the discovery of narcotics and marijuana. K-9 began searching for S-2. S-2 was located in a nearby back yard and was taken into custody by the K-9 after refusing to comply with instructions. S-2 was medically cleared for incarceration at a local area hospital then transported to the main jail along with S-1. "Way to go EGPD! Now is the time to keep an eye on that specific area, from Laguna Blvd to Ranfurly... lots of suspicious activity there. The comment posted January 11. Sounds like you need help because you have problems, BIG TIME! You doin alot of talk, now go visit them in jail.